If you are reading this, this message must be for you. If you do not celebrate any winter holidays, please read on anyway. I believe that people experience everything for a reason. Because you found this, you must be meant to read this special holiday challenge. This time of year can be a special time for everyone, not just those who believe in the birth of a higher power. There are many holidays to celebrate in the winter. Even if you celebrate no holidays, you can still get in the joyous mood this season often brings. The winter holiday season is not about how much you can receive. It's about how much you can give. Everyone knows someone who needs something. The best gift is not always of value in money. However, some might be. Maybe someone you know is in need of a home. Are you willing to share yours? Perhaps your financial position would even permit you to help them purchase a home or even to pay rent for a few months while they get on their feet. Maybe you know someone who may not eat this holiday season. Are you willing to open up your home to them and allow them to dine with your family, expecting nothing in return? Are you willing to give someone a gift that truly means the world to them? Will you do so even if it inconveniences you in some way? If you have no money to spend, it doesn't mean you have nothing to offer. Offer to clean someone's home, offer a hug, or even a free night of babysitting. Visit a shelter and volunteer to help serve food to the less fortunate, even if you yourself are one of the unfortunate ones who cannot afford to eat. The value of a gift is not in the money spent on it, but in the thought put into it. Will the gifts you give mean something more than just dollars spent? There may be someone in a hospice, hospital bed, or nursing home that would give the world just to have a visitor and a hug on their favorite holiday. Could you be that person? What if someone you know has nothing to give or offer to you? Will you still do something for them? Your challenge this holiday season is to give thanks for what you have, even if it isn't much and to give of yourself freely, expecting nothing in return. Will you do it or will you ignore this message? Also, remember that even though holidays will pass, there's always room for giving every day of the year. Let us know in the comments below what you plan to do to help someone. Note: This is an older piece I originally published via Yahoo Contributor Network. However, the message will still apply. What do you do when you have a list of people to buy holiday gifts for and a budget to stick to? 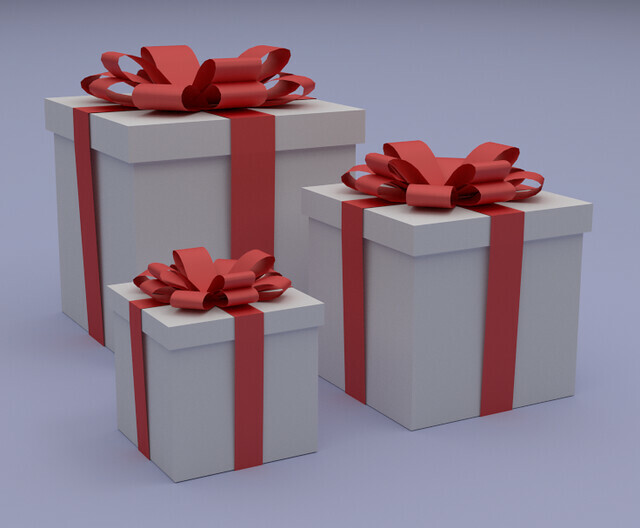 Some websites are now helping you keep track of gifts, as well as any budgets you may have. Here’s how to manage holiday budgets and gifts online using Gift Box Home. Gone are the days of going through pages and pages of paper to keep track of your budget. It's the computer age and time to get with the program. Speaking of programs, you won't even need one to manage your holiday gifts and budgets online. All you need is a computer and an Internet connection. One Website to check out is GiftBoxHome.com, which allows you to manage multiple holiday gifts and lists in one place. Simply sign up and start using it right away. Why Should You Manage Budgets and Gifts Online? When you choose to manage your holiday gifts and budgets online, you are doing the planet a favor. Every little bit helps. By using the Internet, you are saving paper and wasting fewer trees. Another reason to manage gifts and budgets online is the benefit of having everything neat, organized and all in one place. Lists and sheets of paper can get lost in the hustle and bustle of holidays. With the information stored online, you know it's a log on and a password away, not wedged under some stack of papers on the desk. Speaking of passwords, at GiftBoxHome.com, your information is password protected and not shared with anyone. Only you can see it, which is a good thing considering that some people like to peek at holiday gift plans. To manage your holiday gifts and budgets online, simply log on and sign into the website you will be using. GiftBoxHome.com allows for tracking several items. You can manage budgets as well as track your own wish lists and the wish lists of others. This way you won't duplicate or forget a gift. Also included is a way to manage refund dates, upcoming holidays and more. GiftBoxHome.com instructions are easy to use and follow. Stockings can be bought at many retail stores during Christmas time. However, it is also fun to decorate and personalize your own. The instructions below will help you create a stocking all your own, using felt and Christmas-related items. When deciding upon a stocking to decorate, you want to be sure that the color is not similar to the color of the items you want to add to it. For instance, if you want to put red and white candy canes on your stocking, do not choose a red or white stocking. Instead, green or gold might be a better option. Plain stockings can be found at many retail locations, however, you might have better luck with different color options at a craft store. There are many ways to decorate a stocking. Some might prefer to only use the felt and make their entire scene from that. Others may prefer to use ornaments, a small stuffed Rudolph (or other Christmas-themed toys), or even pine cones and sprigs of holly leaf or cinnamon sticks. There is no limit to what you use. This is your stocking. Decide upon the scene you wish to create and the items you'd like to use. Remember from above that you need to be sure your items are not the same color as your stocking. You should have felt in the colors you need to create whatever shapes you will use to create your scene. For instance, if you wanted to make a Christmas tree and a candy cane and have your name in gold lettering, you would need red, white, gold, and green felt pieces. To create your shapes, you can either draw your own shapes on the felt with a marking pencil or use cookie cutters and trace around the edges. For the name, trace each letter you'll need from the stencil onto the felt color of choice. Once all your shapes and letters are traced, cut them all out and lay them onto your stocking as you'll want them to be when finished. You will want to have some old newspaper underneath the stocking to catch any glue drips. When you are doing this, your glue gun can be heating up with a glue stick inserted if you will use a glue gun. Now that all of your felt items are laid out onto your stocking, it is time to also lay any other items onto the stocking, such as ornaments and other decorations you may have chosen. Next, you'll glue each item into place, using either fabric glue or the glue gun. If you are using the glue gun, your stocking will dry and be ready for use fairly quickly. However, if you are using fabric glue, your stocking should dry for 24 hours before use. To prevent your stocking from sticking together, insert an egg carton or piece of cardboard inside it while using glue and while drying. Using too much glue can cause it to leak through your stocking to the other side, which could cause it to stick to your insert or to the other side of itself. Generally, when putting a name on the stocking, it will go across the top, but for a different twist, you can run the name diagonally up or down the front of the stocking. Dollar Tree is a great place to find unique ornaments and craft items to decorate your stocking with. They also sell all the other supplies needed for this project. The shops and lamp posts along the city streets are adorned with wreaths, bows, menorahs, and garlands. The hustle and bustle of the city has picked up its pace, due to gift, food and decoration shopping. You and your children may be among those shoppers. The holidays are drawing near. With all this excitement over presents, feasts, and decorations, have you taken the time to tell your kids the real meaning of winter holidays? First off, you must determine what the holidays mean to your family. The exact meaning will vary from family to family. However, underlying meanings of the holidays can be similar. Many people believe that family is a big part of the true meaning of the holidays. Some also believe giving to others holds a deep meaning during the holidays. Special time spent with those you are closest to can be another meaning behind the holidays. And for others, the holidays can hold a religious meaning. There are always opportune moments to seize for holiday conversations with your child. While gift shopping with your child, you can mention that while some people may be buying gifts, it is not as important to receive as it is to give. Explain about how great it feels to give to others. One way to reinforce that idea is to have your child do something special for someone else. It could be walking the dog of an immobile neighbor or carrying in someone's groceries from the car. It may even be as simple as creating a drawing or craft that is uniquely special to the one it is given to. Another moment to explain the meaning of the holidays could come during grocery shopping to feed visiting relatives. Explain how important family is and what role they may play in holiday festivities, as well as how important it is for families to gather together and celebrate. Spending time together, for some families, only occurs during holidays. For those families it can be extra special. There are other ways to get the point across to your child. Try a few history lessons on holidays from History.com. While discussing various holidays celebrated in December, try discussing with the child common elements, including giving, spending time with family and thinking of others. You may also wish to have the child color some family-themed coloring pages from Edupics.com. Perhaps you are on Travelzoo.com researching the best prices for your family member to visit you. A nice gesture that could provide a great example for your child would be for you to pay some or all of your family member's traveling expenses to come visit you. Donating to those who are in need can also be a wonderful example of teaching the true meaning of the holidays to children. GuideStar.org has an easily accessible list of non-profit organizations that you may want to consider choosing from. If your family holds a spiritual or religious meaning behind the holidays, be sure to take time out to explain this to your child as well. In essence, the methods used to explain the true meaning behind the holidays can vary. The methods you choose to implement don't matter as much as spending time together and sharing the meaning. Want to show off your little angel's voice in time for the holidays? Kids can be amazing singers. But some may have more trouble than others memorizing the lyrics. Be it Christmas, Hanukkah, New Year's, Easter, or any other holiday year-round, kids love singing songs. Here are the lyric memorization tips I've had the best success using with my own kids and those in my care as a former nanny. Start early. You can't start practicing two days before the holiday if you expect the kids to learn a new song. Have multiple songs? Start even earlier. The more time the kids have to practice and become familiar with holiday sing lyrics, the better they will learn them. While there is fun to be had when kids forget their lyrics, it can be satisfying to them to get through a performance without stumbling. Practice often. The key to learning anything well is putting it into practice. Holiday song lyrics are no different. If this is for a school program, there is likely a specific time-frame set aside for practice. If it's for homeschool students or your kids are putting on their own show, practice might be done in a central location for several students or it may take place at the park or in the home. No matter the situation, be sure the kids have plenty of time to practice. Some may also choose to practice extra on their own. Be patient. It may take some kids a while to get the lyrics straight. Be patient and understanding. If they see you get frustrated, they may do the same. A calm and patient environment will likely produce better results than if kids feel rushed. Holiday lyrics can often be confusing to kids because there can be so many variances. They may be used to hearing a song one way and have to learn it another. They may also have never heard certain songs before or just not be good at memorization. Avoid pressure. This falls in line with being patient. Don't push the kids too hard to learn the holiday lyrics. If they mess up at certain points, it's no big deal. They are kids, not robots. Pressure can actually have the opposite effect you are looking for. It can also lead to the kids not being excited about singing carols or being in performances. Pressure takes all the enjoyment out of an activity that is supposed to be fun. Have fun! No matter how long it takes to teach kids holiday lyrics and no matter what methods are employed, the most important aspect is fun. Just have fun! If someone messes up the words, laugh it off and start over. Discuss not just the lyrics, but the history and meaning behind them. Play fun games to help with memorization or relaxation. Remember that the point is not to create perfectionism, but to have some fun with the kids. A perfect show is not necessarily one where every kid knows the lyrics. It's one where everyone has fun. For many, Christmas is a time for baking and sharing traditions with family and friends. Even those who don't usually bake love to try their hand at Christmas baking. With these simple recipes I use for my family, just about anyone can try their hand at baking. I've also tossed in the traditions that we do with them for an extra treat. 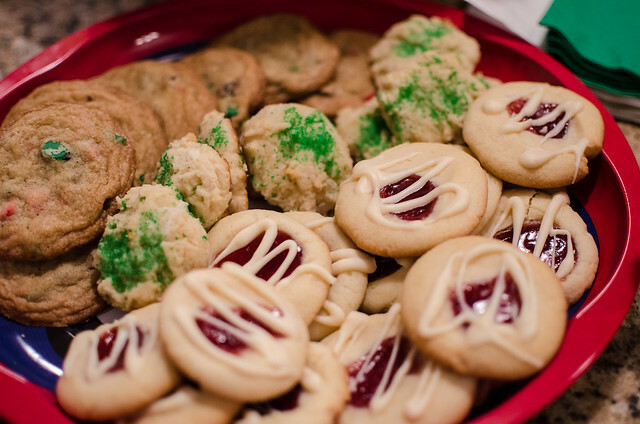 Once your cookies are made, you'll need to get them decorated. What better way than to have a cookie decorating party? Invite friends and family to bring or make their cookies for decorating. While everyone decorates cookies, Christmas music should be playing. Be sure to have a variety of Christmas music, so everyone can enjoy it. Singing along should be encouraged. Sipping on hot cocoa with candy canes on the side for dipping and stirring is a must. Heat 6 cups milk (we use vegan plant milk protein instead) to simmering in a saucepan. Pour in 2 cups of powdered cocoa slowly, stirring it as you add it. Also add ½ cup of sugar. Stir all ingredients until blended well. Remove from heat and serve. This serves about 6 people. What's Christmas without the cookies? Here's a fun sugar cookie recipe that can be rolled out for use with Christmas cookie cutters. Some people mix the dry ingredients first, but not me. I just throw all the ingredients in together and mix it up. So, put all of the above ingredients together into a large mixing bowl. Stir them together and then once you have a shape that starts to lump together, take it out and set a pre-floured surface. Knead it a few times. Our family enjoys baking every day of the year, but Christmas is our favorite of all. We enjoy baking breads, pretzels, and cookies. Above, you saw how we enjoyed having a party with the cookies. However, with the bread and pretzels, we prefer to just do this with close family members. Much like the cookie party, we still sip hot cocoa. However, we also talk, laugh, and play and possibly watch a good Christmas movie. Here's how to make your very own Christmas Pretzels and Christmas bread. Homemade pretzels are a cinch to make. Did you ever think about making them Christmas style? Well, now you can. It's quite simple actually. First, you'll need to make this pretzel dough. Get a large mixing bowl. Pour in the warm water first. Next slowly stir in the yeast until it dissolves. Next, add the flour and a couple drops of either red or green food coloring, whichever you want. If you'd like both, you can make two batches. Knead the dough until it's smooth. Cover with a towel or cheesecloth and let it rise (usually 30 minutes to an hour). While you're waiting for that, add the brown sugar and a drop of the same food color you used for your dough to the beaten egg. Once the dough has risen, you are ready to make the pretzel shapes. Flour the bottom of a baking sheet and preheat the oven to 350 F. Take out some of the dough, forming a ball that is about 4 inches in diameter. Now, roll the ball on the table until you get something long, resembling a fat worm. Shape that into the pretzel shape. Repeat this until you have used all your dough. Now, with the unbaked pretzel shapes on the baking sheet, lightly brush them with the egg/sugar mixture. Bake them for 10 to 20 minutes, depending on your oven. When they are done you might wish to add salt. That's it. Enjoy your Christmas-colored pretzels. We love baking bread together and the fresh taste and smell of homemade bread brings back many warm memories. Present this tasty bread topped with cinnamon sticks and crushed red hot candies. Get a large mixing bowl. First, put in the warm water. Slowly stir in the yeast until blended. Next, put in all of the ingredients except for the Maple Syrup, Cinnamon sticks and Red Hot candies. Once stirred well, knead the dough until you have a solid ball that is neither too sticky nor too dry. You want something like the consistency of play dough. Now, cover the dough in the bowl with a towel or cheesecloth. Give it about an hour to rise. Once it has done that, place it into a floured bread pan and bake it at 350 F for about 15-20 minutes, depending on your oven. Once the bread is done, butter the top and let it cool to warm. Cover the top with a thin layer of maple syrup. Then, sprinkle the crushed Red Hot cinnamon candies over the top. For garnishing, place the cinnamon sticks atop the bread neatly in a criss-cross design. Ever wonder if Santa's tired of eating the same type of goodies at every house? To give Santa some variety, simply arrange one or two each of the treats from above onto Santa's Christmas platter. Be sure that you arrange them nicely. For extra measure to be sure Santa's treats stay fresh, wrap the platter in cellophane and top it with a pretty bow and some cinnamon sticks. Be sure that the kids do much of preparing Santa's treat. This is generally their favorite part.